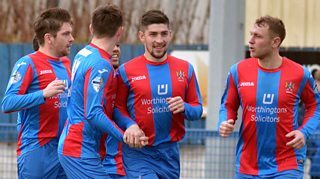 Ards twice come from behind to earn manager Colin Nixon the first victory of his tenure in the New Year's Eve Premiership game at the Bangor Fuels Arena. Goalkeeper Aaron Hogg was credited with an own goal for Ballymena's first goal, but Carl McComb restored parity. Johnny McMurray put the Sky Blues ahead again, before Kyle Cherry brought the teams level again. Further strikes from Emmett Friars and substitute Gary Liggett ensured three points for the hosts.